Following up on Chip McClelland’s IoT presentation at this month’s meeting at NCSU, here’s a Freescale/Arm high level take on what’s needed to build out the Internet of Things. The figure on page 10 and the table on 11 are handy to get a feel for different communication schemes out there. At the TriEmbed meeting this coming Monday I’ll be asking if others are interested in joining a systematic self-study of Kicad. I knew I’d be driven to this sooner or later, but the future is now, as they say. I’m working on a combination clock calibrator and frequency counter and find the design process dominated by the challenge of fitting the silly thing into a single Eagle schematic sheet. Update: A “Kicad Study Group” page has been added and at least a half dozen folks expressed interest in taking part. Update: Nobody’s missed anything, time’s just run short this month. Many Arduinos are based on the Atmega 328 P chip. Note that P. If you buy raw chips be sure the P is present. 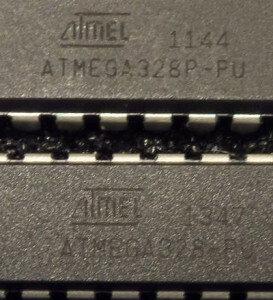 When you look up “Atmega328” at a site like Digikey the P and non-P versions are side by side and you might just go for the cheaper one without noticing the difference. You will be sucking persimmons if you’re missing the P. I am now a relative and reluctant expert about working around missing Ps. One might say I’m P‘ing into a pot with information I wish I didn’t have. Actually, it was many months ago that I accidentally bought some P-challenged Atmega328 chips. But it was only today that I realized I was down to the bottom of the barrel and forced to replace a P with a non-P in an Arduino Uno, and that situation can best be spelled PO. THIS CHIP ABOVE IS THE Atmega328 CHIP YOU DO NOT WANT. Notice how you can’t read the markings? That’s an accidental hint about which is the correct part, but also indicative of the apparent conspiracy the chip makers are involved in to make sure non-machines (i.e. us) can’t read the markings in ordinary conditions. Both chips were close to flat, but the bottom one was obviously not flat (or tilted with respect to the light source) enough!!! Postscript: Making a 328 chip run in an Uno is a total Pain. I should probably document that some place to save the next person some trouble. However once it’s done the fact that it’s the “wrong chip” is no longer visible if you’re using the bootloader to program it.